Raw cauliflower – Could it be nature’s most perfect shredding toy? 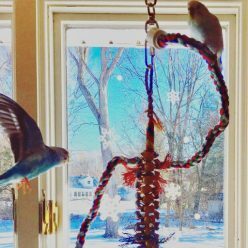 I always try to serve the parakeet a wide variety of vegetables and fruits, but they do tend to eat the same things we are eating. For example, if we have a pepper they get the pepper head and seeds. 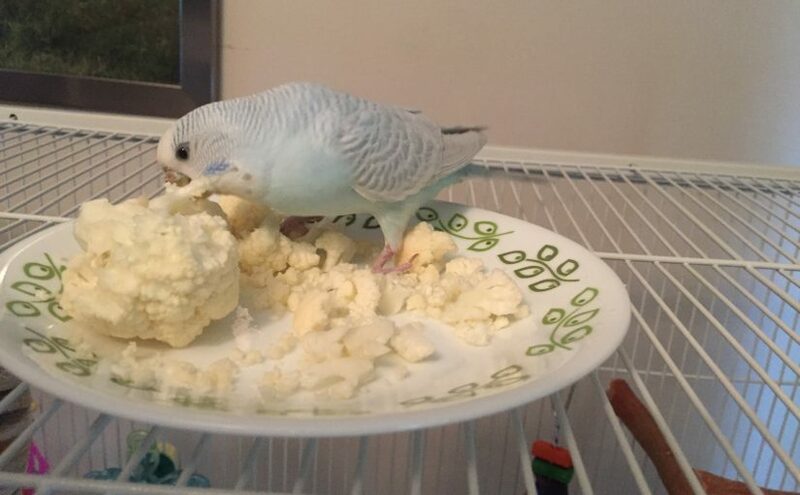 Apparently we don’t eat a lot of cauliflower , because I bought a head this week and gave raw cauliflower to the parakeets for the first time, and they were in love! The hope when trying a new vegetable is always that they will give it a nibble and maybe be more likely to try it the next time around. They were a little wary of the cauliflower at first, I gave them a few big florets and also chopped some up in small bits. Very rapidly they discovered that not only was it tasty, but it was an amazing shred experience. They really enjoyed hooking their beaks into the crevices in the cauliflower and then tugging until they broke pieces off. They would do this to each floret until it was almost smooth with nothing else to hook into. I know they mostly threw the cauliflower around but I’m sure they couldn’t have avoided eating some of it as well. I gave them more raw cauliflower a few days later to see if it was a fluke and they went crazy for it again, this time I did mostly larger florets and they had a ball shredding them. They also enjoying picking them up and pretending they were heavyweight champions of the world, throwing the florets at each other and off the top of the cage. 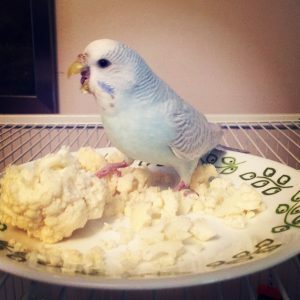 We did have some territorial food issues, Kelly certainly felt like she was queen of the cauliflower. That’s pretty typical and I guess a good sign that they both really loved it. This was as insanely messy snack, which would be the only downside. Because they started throwing pieces large and small I ended up with what looked like a chunky coating of snow on the interior of Toby’s cage floor as well as the floor below, some on the walls and even under the radiators! I think that I might try giving them a whole head someday to see what they would do with it, maybe for someone’s birthday treat. Otherwise I think that reasonable amounts of cauliflower will definitely be in our regular rotation from now on. 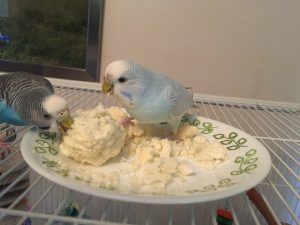 Next Next post: Parakeets and food silos = less mess?